Kavita lives in Dharavi, Mumbai. She was born and brought up here and at present, lives in a three-storied compact and comfortable house with her family that makes up a husband, two sons and a mother-in-law. Kavita is the woman who supplies homemade lunch to the Urbz office. Every day, the office orders 3 to 5 portions from her, depending on the number of people present for a meal. She cooks at home and delivers the food between 1-1:30 pm, in steel tiffins, through one of her female relatives. 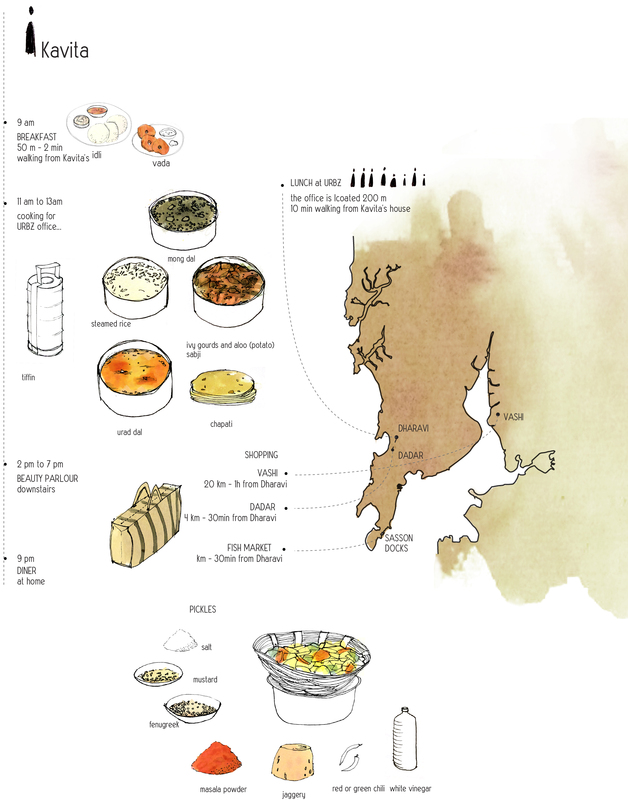 One aspect of our study on circular urbanism and the food industry was to look at the journey of the agricultural food produce from the market to the plate, on a consumer’s end, to do a life-cycle mapping of a product. For the purpose of the study, we were looking at different case studies, and that is how Kavita became part of it. On asking her for her assistance, we were welcomed to her place to observe and assist in the lunch preparation. After navigating the intricate network of lanes of Dharavi, we reached a narrow lane with a small pathway on side, which led up to Kavita’s place. The ground floor makes up her beauty parlour and the rest two floors make up her house. We went up to the first floor, stepping on the outdoor metal staircase, situated in a narrow strip in between two walls. This strip is the place where her mother-in-law sits during the afternoon, like a guard on duty, either busy with some small household work or just sitting and observing. 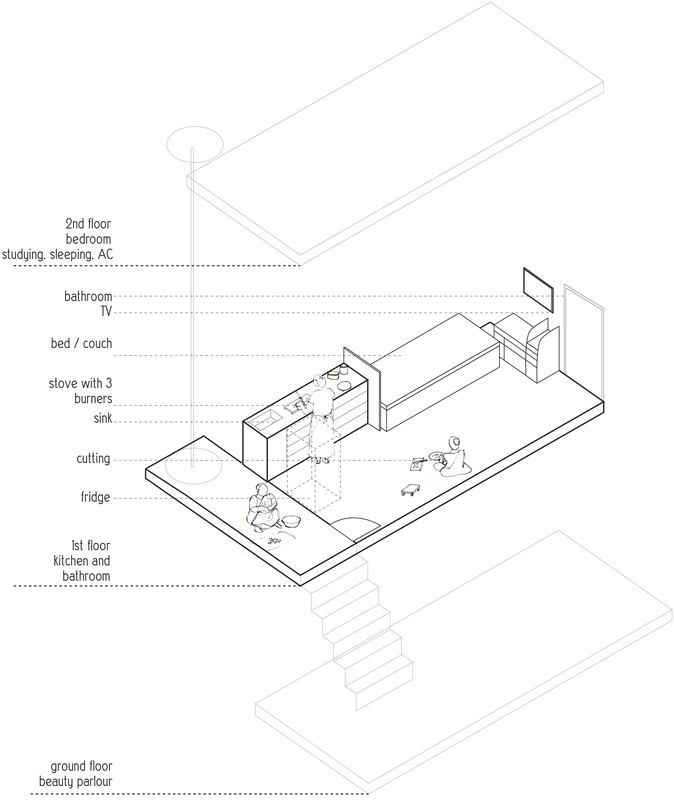 The main room is lovely and colorful with a simple layout, divided into two parts: the kitchen and the living room. The living room is decorated with paintings and tiles on the walls, a worshipping structure attached on the wall, a bed, and a couple of chairs, a stool and a TV. The kitchen consists of a modular platform (helpful in economizing space), with a sink and a three-burner stove, and a big refrigerator, which helps her in stocking fresh ingredients for a week or more. The dexterity with which Kavita performs every step of the cooking process- such as cutting, washing, frying, rolling, steering - shows years of experience. Her knowledge about the cooking time for each ingredient, and the exact amount of spices, salt and oil to add to each dish is a reflection of her expertise and experience. The result is a delicious meal. One key component of every tasty Indian meal is the careful choice of each ingredient and the proper timing and method of cooking. Kavita does not use any processed ingredient but prepares everything from scratch (raw materials) at home. This includes preparations according to different needs ranging from daily to weekly, monthly and yearly. On the yearly end, she buys whole grains to make flour of different kinds; prepares different spice powders and their mixes from the whole ingredients, and various kinds of pickles to store. She purchases most of these things from Vashi, APMC market ; she visits the market twice in a year (May and January). For weekly and daily needs, she makes different kinds of pastes such as ginger-garlic, coconut, tomato. This meticulous operation and functioning of a kitchen is the traditional way most Indian women run their households. To get a further insight into the movements within various distribution channels of the agricultural produce (from the wholesale APMC market to a big retail market like Dadar to small markets existing in various localities and street side vendors), we accompanied her on a weekly shopping trip to Dadar (a vegetable market) to understand her shopping preferences. Spending a morning with Kavita, shopping for fresh vegetables and herbs at Dadar market, and observing her makes it obvious that no one can fool her on freshness and quality of products. She can tell by smell, texture, colour, and variety, which will be tastier or last longer or suits better to a particular dish, which is exactly what makes her food so delicious and savoury. Apart from shopping from different markets in order to get the best price and the best products, Kavita gets a few supplies from regular clients, such as a pack of raisins from a customer’s farm every year, and freshly made bhakri (rice chapattis) by another female entrepreneur in Dharavi. The tools that make Kavita’s business work efficiently are the mobile phone (for placing orders), her kitchen-the workspace-where she actually prepares the food and the dabba service (the tiffin box - transport system) which takes the food to her clients. In her case, a family member transports the food daily. The system is widely known as the Dabbawala service , a much documented and discussed system. Although, Kavita is not part of this documented system, the service she provides is similar. Apart from assurance of freshly cooked food, Mumbaikars have plenty of reasons to prefer homemade food in tiffin boxes delivered to their offices every day. It is cheaper than going to a restaurant, is delivered hot, and is relatively free of plastic packaging. Above all, it ensures that you eat according to your diet. Like many metropolitan cities, Mumbai is inhabited by a large population of migrants with different origins and religions, which shapes their diet such as a section of Hindus being vegetarian, Jain people not eating roots, and Muslims not eating pork. When most of the European and Western cities are associated with a lifestyle of consumerism these days, where hectic life and work rhythms prevent you from taking time to cook, making you more dependent on ready-made food, Mumbai seems to have implemented a unique system for workers to eat healthy homemade food every day. This comes with a positive outcome of providing additional income to men and women like Kavita. Kavita says that she would love to extend her tiffin business, if she gets the opportunity. At present, Urbz office is her only client. She is a good example of a local homegrown entrepreneur with her main source of income being the beauty parlour. Her clientele consists of women from the entire neighborhood and their relations. It is common for people in Dharavi to have multiple jobs. She can afford the school fees for her children because of her two jobs, and support the household expenditure, independently of the income earned by her husband. This is mainly possible because she operates from home, her Tool-house. While cooking for the client, she cooks enough to keep a portion for the house as well, and is available for clients at the parlour, who show up at any time. If cooking makes her too busy, she asks for help from one of her numerous female relatives who live nearby. Like other entrepreneurs in Dharavi, Kavita has created a social network, through her different jobs, a resource nourished by and in turn nourishing the neighbourhood, of which urbz is an integral part. 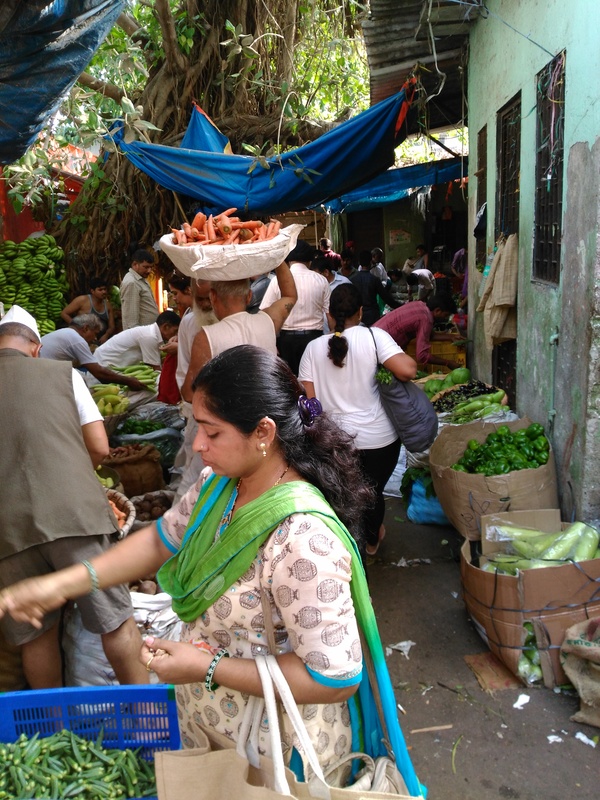 Kavita buying fresh vegetables and herbs at Dadar market. Cutting vegetables in Kavita's living room. Spices and pastes used in various dishes. Cooking rice, dal and vegetables. Packing the lunchbox which gets sent to the urbz office everyday.